Love him or hate him, David Atlee Phillips was good at what he did. Like many in the CIA, David Phillip’s career began after WWII. He was a gunner in the Army Air Corps, and his plane was shot down leading to his capture(1). For one year after his capture, Phillips served as the escape committee’s director, helping soldiers escape German captivity, until he eventually escaped himself and reported to General Omar Bradley (2). Phillips’ career was by all standards a successful one. He was involved in almost every major event in the Latin American region, rising to the level of Head of the Western Hemisphere. The biographic profile of Phillips below, demonstrates his desire to be an actor early on in his life. This career path was derailed by WWII, but those acting skills, the creative mind that wanted to be a part of theater, made him the perfect operator in the world of propaganda and psychological operations. 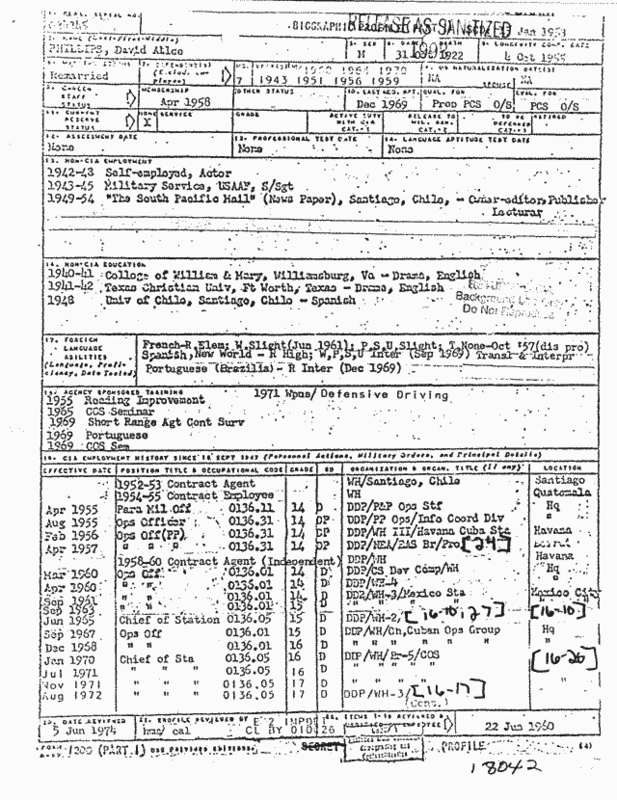 You can see in this document, the awards that he received in the “cause of freedom.” Phillips was also recognized for helping to receive President Kennedy to Mexico City in 1962. David Phillps was a journalist in Chile when he was recruited into the CIA in the early 1950’s becoming an undercover asset specializing in propaganda. His storied career led him to be involved in many cold war operations that were vital to the United States interests in the hemisphere. 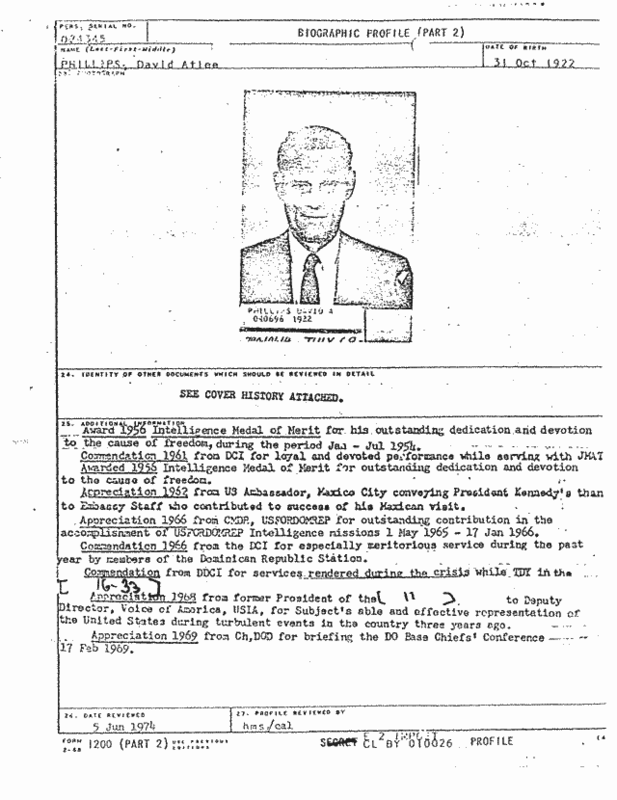 His obituary matched his CIA biography but adds to the details. Mr. Phillips was present when the C.I.A., with President Dwight D. Eisenhower’s blessing, toppled the Government of Jacobo Arbenz Guzman in Guatemala in 1954. He was a lecturer in Havana and a businessman in Lebanon before going to Washington in 1960 when the C.I.A. planned to duplicate the Guatemalan feat in Cuba – an effort that foundered in the Bay of Pigs. After Fidell Castro came into power in Cuba, the CIA began it’s planning to topple his government and turned to the operatives that were successful in the removal of the Guatemalan government. A special task force was created to address the Cuban situation on January 18, 1960. The creation of Western Hemisphere branch 4, WH/4 (JMATE/JMART) was created with Jake Esterline at the helm, because of his success of PBSUCCESS (7). By February 10 David Atlee Phillips was in a planning session to help plan propaganda activities against Fidell (9). At the first “official” meeting of the WH/4 group on March 9, David Phillips was named Propaganda Officer and giving him oversight of Phil Toomey the psychological strategist (10). Who better to to run the propaganda machine against Castro than David Phillips? With the success of operation PBSUCCESS virtually on the basis of Phillips operations, he was the logical choice to tackle the situation in Cuba. The commendations he received for this operation indicated that there was nothing in the history of psychological warfare that even came close to what he accomplished. One of the main thrusts of Phillips domain was an operation similar to the work done in WWII through The Voice of America. This portion of the operation required the construction of two radio towers on Swan Island. Thomas Cabot became the president of The Gibralter Steamship Company, created with the soul purpose of building this secret radio station. In 1960, a Central Intelligence Agency cover called Gibraltar Steamship Company (which didn’t own any steamships and whose president was Cabot) owned and established Radio Swan on Swan Island, a covert black operation to win supporters for U.S. policies and discredit Fidel Castro(11). The construction of this station was no small feat. It required the cooperation of the Navy, The Seabees, The Coast Guard, Immigration and Naturalization Service, and the Federal Aviation Administration. In April, David Phillips in a presentation to the Director of the Central Intelligence Agency, Allen Dulles, that the Swan Station would be operational and broadcasting propaganda into Cuba by May 17(12). A secondary radio station was utilized for the propaganda operations against Fidel Castro. This was WRUL transmitting out of Scituate, Massachusetts. WRUL, a short wave radio station originally began as W1XAL, and its broadcast studio was at the Harvard Club, on Commonwealth Ave. in Boston. In 1939 the radio station was needed for a covert British operation at the time Great Britain declared war on Germany. At this time, the radio station was given the call letters, WRUL which stood for World Radio University Listeners. The radio station was used by the government of Norway in 1940 to help counter German transmissions to their merchant ships, that were directing them to dock at AXIS ports. By 1942, the United States Government had taken the station over and the Voice of America was born(13). The US Government had set soldiers at the sight of the radio towers to guard it from sabotage (14). There were German spies that were dropped of along the Eastern Coast, and Scituate had a sighting of two spies. In addition, there was a German uniform found buried in the sand of the beach near where the WRUL towers were located. One veteran of the era reports a German was killed near a tower, possibly WRUL, but that the story was suppressed to keep hysteria from spreading throughout the area (15). The radio station was used for the propaganda machine that David Phillips ran, up to the Bay of Pigs. Phillips worked closely with the Voice of America’s director, Henry Loomis (16). Phillips received commendations for his work with Voice of America in 1968. By this time, the stations offices were in NY, while the transmitters remained in Scituate, MA (17). However, this was a very different operation for David Phillips than the one he ran for Operation PBSUCCESS in Guatemala. According to the OFFICIAL HISTORY OF THE , BAY OF PIGS OPERATION VOLUME III EVOLUTION OF CIA’s ANTI-CASTRO POLICIES, 1959-JANUARY 1961 David Phillps spent a lot of energy into making sure the many different factions of Cuban exiles, with their own interests, had time on the broadcasts from WMUR and a proposal was put forth to give the different factions of Cubans a rotating schedule of time on WMUR starting on December 1, 1960. In Guatemala, he controlled a unified message, with a small team of people. For this operation, he was stationed in Washington, New York, and MIAMI and was under orders to ensure that the different factions of Cubans were given time on the airwaves (18). Hammered across the idea that Castro had double crossed the Cuban people by abandoning the programs and promises that originally had won him support. 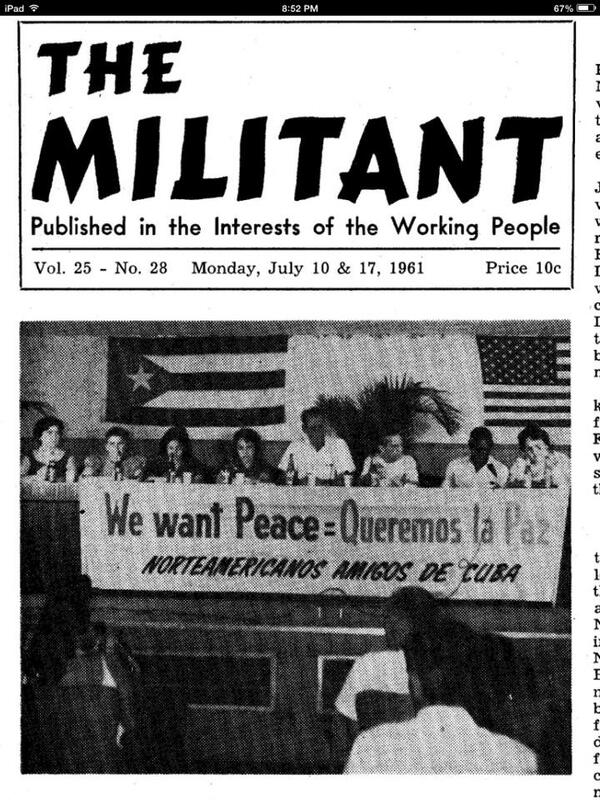 None of the CIA’s propaganda, spoken or printed, ever urged the population to rise up against Castro. This appeal, suicidal before the invasion, would be used when, and if, the Provisional Government obtained a lodgement on the island (20). One faction of Cuban revolutionaries was Frente Revolucionario Democratico (FRD). Phillips who had been a newspaper man was actively producing propaganda on multiple fronts. One example of this is found in this cable to the Mexico City Station in which Phillips is requesting the assistance of E. Howard Hunt and other members of the Mexico City Station to support a newspaper designed to provide support for the Frente Revolucionario Democratico (FRD). Phillips wanted to coordinate the newspaper articles with broadcasts recorded by members of the FRD for the SWAN station. Phillips operation with the FRD(AMCIGAR)(22) was in full force in August, with money being deposited in accounts for E. Howard Hunt to fund the efforts. This was a group that Phillips had worked with prior to the Bay of Pigs. A deposit into a Swiss bank account was made in the amount of $75,000 as a Memorandum from the Finance Department stated in August (23). From that account the AMCIGAR program was given $20,000 from this account on August 11, 1960, and there was a request for additional funds for twelve students waiting for Walter C. Twicker (E. Howard Hunt (24)). By October, the FRD manifesto was completed and waiting to be approved for publication (25). While a part of this cable is still redacted, it indicates that there would information going to the press as agreed to by Twicker (E. Howard Hunt). There is much more to the story of the AMCIGAR operations that can be found in Jefferson Morely’s book, Our Man in Mexico. In his book he details the difficulties that the CIA had with the AMCIGARs from the perspective of Winston Scott, the Station Chief of Mexico City. This was Phillips operation and it they were a part of the propaganda machine that was geared up for the build-up to the Bay of Pigs Operation. 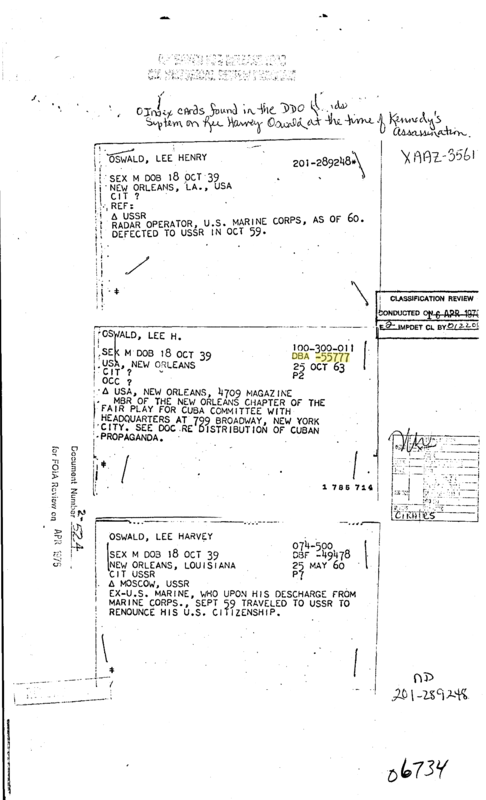 In his description of the candidate for this operation, Phillips wanted to have a candidate who was well known in Havana so that they would be “missed”. The person had to be able to memorize thousands of details so that they would be able to stand the media scrutiny. The final part of this plan included that, “After brief but dramatic exposure to the press an “attempt” would be made on subject’s life. For this reason he will go underground so that “they” will not liquidate him (29).” This is quite the elaborate plan, that was not based in fact, but would give Phillips some really good material for either WMUR or the Swan Station. Phillips recommendation for recruitment was to tell the potential recruit that the CIA really believed that there were Cuban prisoners being sent to Russia, but that they had been unable to prove it. To reward the volunteer Phillips suggested time in Paris and permission to return to Cuba with the invading forces as a hero. This operation was proposed on August 24, 1960. It was reviewed by Allen Dulles, Gerneral Cabal, and Richard Helms. It did not get permission to launch the operation, however, Richard Helms approved finding a candidate for the operation, but ordered them not to tell the subject the plan. Helms directed that any further communications about this potential operation had to go through him (30). There were assassination programs that are documented by the CIA historian. It appears that these programs were kept outside of the JMATE group. This included the operations involving CIA Agent Bill Harvey (ZRRIFLE) and his relationship with the mafia, and his operations that were eventually shut down by Robert Kennedy (31). In addition, there was a program for assassination called AMHINT that was brought up in a meeting with Jake Esterline and Phillips, it is documented by the CIA historian that the operations for the Bay of Pigs, did not include an assassinations operation. The historian notes that the AMHINT operation was run with members of the FRD, a group with direct contact with Phillips. There was a request for silenced rifles, for an attempted assassination on a Cuban Official. The CIA did not approve the operation. 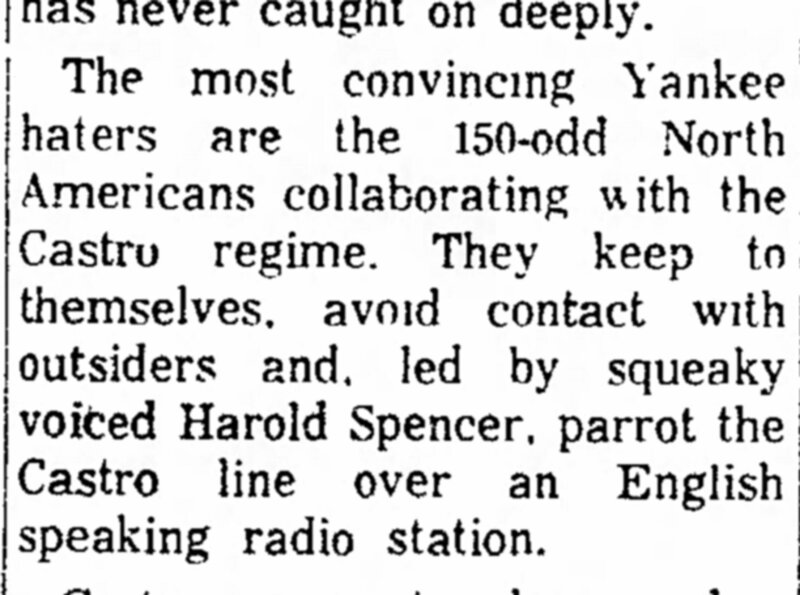 The author does make note that the Swan Station was used to broadcast propaganda that Che Guevera had been assassinated, to annoy the Cuban Officials, even though at the time he was not yet dead(32). David Phillips was one of the many CIA agents who felt that the Kennedy brothers had betrayed the Cuban people at the Bay of Pigs. His career continued with the CIA with much success. After the Bay of Pigs he was assigned to the Mexico City Station, and oversaw two operations that connected to Lee Harvey Oswald over the course three months prior to the assassination, one inside of the Untied States in New Orleans (AMSPELL) and one in Mexico City (LIERODE). There were two other operations that Oswald ran into just prior to the assassination, LIENVOY and LIEMPTY(33). These operations and the fact that they were still secret at the time of Phillips death may have contributed to the belief by those in the assassination research community to point their lens in his direction. Then again, knowing about these operations, in some ways raises more questions about this Cold Warrior. David Phillips believed in his secrecy oath, and went to his grave holding secrets that were not ready to be shared. who will put Humpty Dumpty back together again? Scenes burnt beneath his boots from 20,000 Ft.
twice he fell into the mist, there was no time for sleep. he cried once to a tree for hours, yet he carried well his pain. the battle rages on today, the war is fueled by wills. and if God forgives transgressions, then I guess we all can do the same. So pass in peace my Father’s brother, I feel you were my friend. (23) NARA Record Number: 1994.04.12.15:55:23:130005 Reel 26, Folder J – FRENTE REVOLUTIONARIO DEMOCRATICA; FRD-MEXICO.